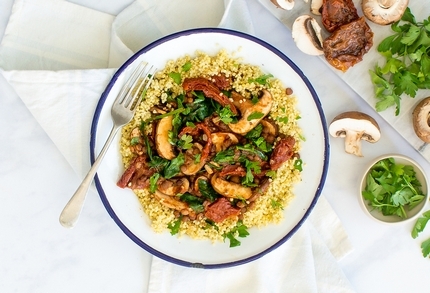 This Mediterranean themed recipe provides you with iron rich lentils with sundried tomatoes and mushrooms for a balanced meal for two suitable for vegans. It takes about 25 minutes to make. 1. Boil a kettle. Finely chop or crush the garlic. Thinly slice the mushrooms and rainbow chard then roughly chop the sundried tomatoes. 2. Heat a dry saucepan and pour the millet in before the water. Toast the millet for two minutes, stirring constantly. Pour in 400ml boiling water, then reduce the heat, cover and simmer for fifteen minutes. 4. Heat a medium-sized pan with 1/2 tablespoon of oil on a medium heat and add the garlic for one minute. Then add the mushrooms and sundried tomatoes for three minutes. Add the passata, vegetable stock, lentils and rainbow chard and leave to simmer for five to ten minutes until the sauce has thickened. Season with black pepper. 5. To make the parsley oil; finely chop the parsley and add to a bowl with one tablespoon of olive oil, mix well. 6. Drain the millet and season with a pinch of sea salt. Then fluff up the millet with a fork. 7. To serve, place the millet on two warm plates, spoon over the lentils and drizzle over the parsley oil. This provides 488 calories, 64g carbs, 17g fat and 21g protein. Claim a £10 off when you order ingredients delivered with more recipe cards at Mindful Chef.